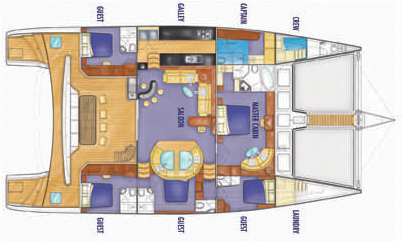 King's Ransom features a main-deck, king-berth, master suite, and 4 queen berth guest suites. The midships starboard queen suite may be converted into two twin berths. King's Ransom is fully air-conditioned throughout and each guest suite has its own flat-screen TV & DVD player. Niv grew up in Israel, born and raised by the sea of Galilea. Growing up next to the sea, he soon developed a passion for sailing. In his youth he spent a year sailing in the south pacific. He then came back home to complete his Bachelors of Science in Marine Biology. During his studies he volunteered with kids at risk as a sailing and surfing instructor and views the ocean as the best teacher and educator. He later completed his MBA in sustainable development. As an avid diver and biologist, he has sailed and explored diving locations all over the world. From Australia and the South Pacific to the Red Sea, Mediterranean and the Atlantic ocean. A highly experienced and qualified Captain, he has been working together with his wife Liron, for over 10 years, developing their skills and chemistry as a crew and as a couple in order to provide the most professional and high standard service. Their charming personalities and expertise create a relaxed atmosphere and a safe environment for everyone to enjoy. Over the years he has proven himself as a successful and capable Captain within the charter yacht industry, developing a fond following of satisfied guests. With his natural humor and personable, easy going nature you are assured an unforgettable time aboard Kings Ransom. He will assist in designing your own unique itinerary and make you feel at ease afloat, as he safely steers you through the beauties of Kings Ransom’s cruising grounds. Liron grew up in the port city of Haifa, Israel on the Mediterranean coast. She discovered her love for the ocean early on when her dad, a lifeguard practically raised her on the beach. She started working in restaurants since she was 16 years old; her drive, work ethics, passion for food and creativity brought her to be a head chef in charge of 15 cooks by the age of 22. She continued to develop her love for the ocean and worked on her Skipper license knowing that her dream was to combine her two loves- food and the sea. As an experienced sailor, she enjoys working with her husband Niv. Together as a team they take great pride and joy in fulfilling their dreams. Together they take pride in creating the best sailing environment they envisioned for their guests combined with her passion for food and love of entertaining. 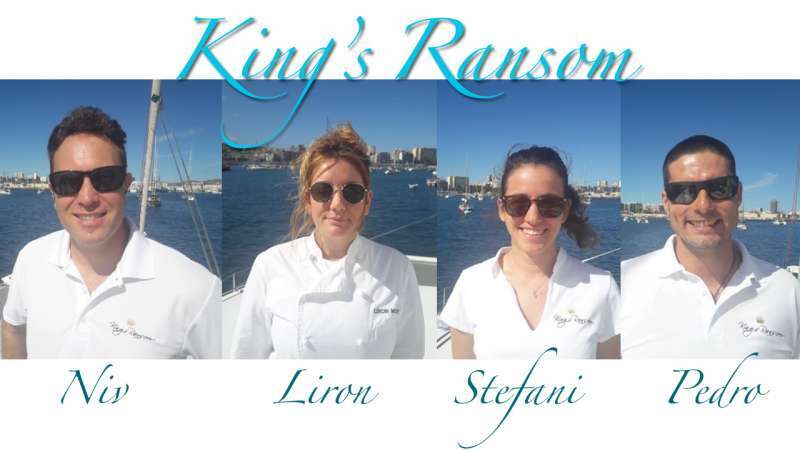 As a professional chef and experience in top restaurants her menu reflects her careful use of fresh, local produce creating dishes full of flavor and skillfully served from the galley of Kings Ransom. Passionate about your culinary experience afloat, she will assist individually designing a menu based on your specific preferences. Her creative dishes are sure to enabling a gourmet experience for her special guests aboard. Stefani was born and raised in beautiful Motenegro. Her parents love of the ocean was instilled in her from a very early age. She spent her youth with her father a sailor and her mother a diver growing up on the beautiful beaches. After graduating from physiotherapy she was naturally drawn to the ocean. She decided to combine her two loves and travel the world as professional massage therapist and stewardess. Hospitality, service and attention to detail are Stefani’s strengths. Her charismatic personality and friendly nature always make sure her guests have an unforgettable experience aboard. As a qualified physiotherapist she is able to offer guests massage therapy aboard. Sit back relax and enjoy the service and the scenery aboard with Stefani as your gracious hostess. Pedro is a water enthusiast and continues enjoys a plethora of water sports including diving one of his biggest passions. His easy going nature, great sense of humor, and energy makes him the ideal first mate during your charter aboard Kings Ransom. He is full of energy and always excited to share is love of the sea with guests aboard. He enjoys taking guests out in the new on our spacious tender, help develop their water sports ability, experience sailing the hobby cat aboard and assist in taking advantage of the countless water activities. As experience sailor he naturally creates a relaxed atmosphere and a safe environment for everyone to enjoy. His interest in travel and love of exploring new places and meeting new people eventually led him to the yachting industry. Pedro is an out-going crew member and his well natured and enthusiastic personality will make your charter with Kings Ransom unforgettable.